Stradbroke Island is located on the North of the Gold Coast. The island provides a stark contrast to the many high rise resorts and extremely lively nightlife of Surfers Paradise. In fact, South Stradbroke Island remains largely undeveloped, providing a range of unique flora and fauna such as the Golden Wallaby. Looking for South Stadbroke Island Accommodation? The island provides perfect lagoon-like waters for water activities such as swimming, fishing and boating and also provides surf breaks, depending on the side of the island you are on. You can also take a trek through beautiful tropical bushland and visit large sand dunes. You can simply go to South Strabroke for a day trip or you may decide you want to go to South Stradbroke for a few days. 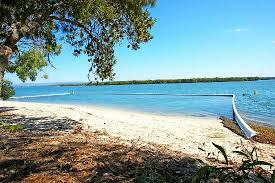 If you are wanting to stay over you can enjoy camping, South Stradbroke Resort and other self-catering accommodation. Bookings are necessary. You can even get to South Stradbroke Island via water taxis that provide links from Main Beach or other water access via Runaway Bay. For a fun way to explore South Stradbroke Island, you can book a day tour. South Stradbroke Island Day Tours may include: catamaran trip over, BBQ lunch, paddle boat, canoe ride as well as the option to purchase other activities such as jet skiing, tobogganing, tube rides and more. Relax and enjoy a sightseeing cruise to South Stradbroke Island. Soak up the sun on a cruise on board the MV “Spirit of Paradise”. Departing from Marina Mirage you will travel along Gold Coast’s calm waterways past the Sovereign Islands, Couran Cove and then stopping at South Stradbroke Island Resort. South Stradbroke is one of Australia’s rare and unique sand islands. This undeveloped island is an unspoiled beauty and boasts a vigorous diversity of both Australian flora and fauna.